This London dental practice was established in 1998 and has always focused on looking after the teeth and oral hygiene of workers in the heart of the City. Over the years the practice built a strong reputation and many new patients made appointments after referrals from colleagues and friends. In today’s world where consumers generally search online for a dentist, even after a personal recommendation, transferring that great reputation from offline to online became a priority. Using the Smart Reviews system has allowed the dental practice to develop an ongoing reputation management strategy that delivers a steady stream of positive reviews. Targeting more reviews on Google was a priority but Smart Reviews also made it simple to direct patients towards leaving reviews on other sites, including Facebook and TouchLocal. The system also delivers a summary email of all new reviews in the past week to the the Practice Manager so they can respond to reviews appropriately, as required. Began with less than five reviews on Google, so no gold stars showing. After putting the Smart Reviews program in place there are now over 60 reviews with an aggregate star rating of 4.9. The practice is gaining between 2-4 new reviews on Google each month. Started with five star ratings, all given in January 2014. There are now a total of nine 5 star reviews containing extended detail about the level of care and quality of dentistry. A single bad review from a dissatisfied patient in 2008. This review is now surrounded by four 5 star reviews and the visibility of the single poor review has been greatly reduced. The practice recently ran a test with the new Smart Reviews email program, which prompts patients to leave a review on the site of their choice. From 32 emails that were sent out the dental practice received a total of 5 reviews, four on Google and one on Facebook. 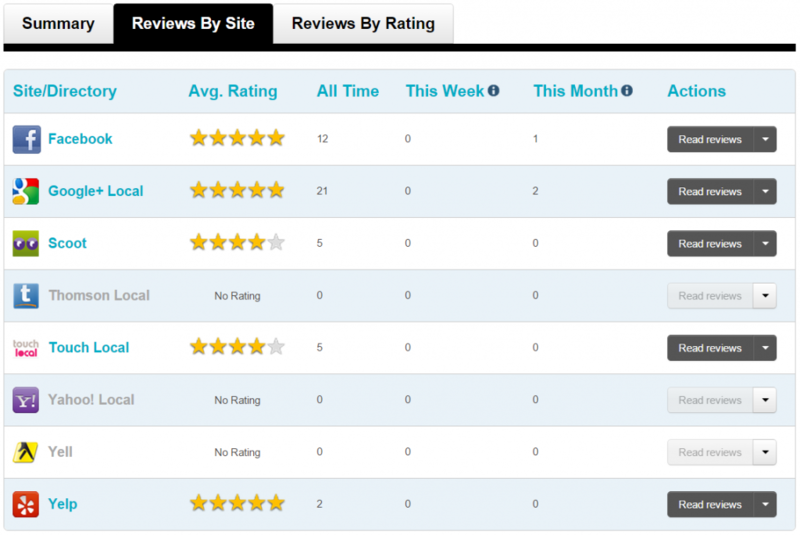 That’s a reviews collection rate of over 15% and shows how effective the program can be. Getting reviews for the practice was something that we struggled with in the past but with this system in place it makes the whole process much simpler, both for us and our patients. It’s starting to have a positive impact on our business too. We generally ask new patients how they found us and why they chose to come to our dental practice. Many of them tell us that, along with the convenience of our location, it’s the number and quality of the reviews we have. They feel like they trust us before they even call to make the appointment and that is priceless for us. 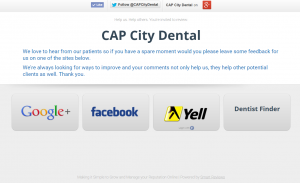 More reviews for CAP City Dental has most definitely led to more patients.